It’s Fox hunting season, except this time, the foxes have the upper hand in this classic Microgaming slot turned mobile. 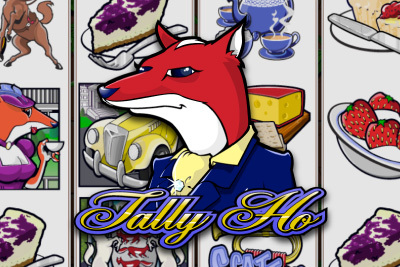 Tally Ho mobile slot is a 5 reel, 9 payline, 10 coin game. As such you can expect the same great game play as with the original Thunderstruck game. That said this is more on the low the medium volatility slot of Thunderstruck, so expect smaller wins. Yet with a 95% – 96% return to player rate, this slot has reasonable return. You just need a little patience to hit those free spins with 4 x multipliers, where the big wins of the games are hiding. The theme lacks excitement though. We like the twist on the ‘high lifestyle’ theme, where it’s the foxes that are living the good life, drinking Martinis, driving classic cars and having strawberries and cream on the lawn. But the images lack imagination and we always find it difficult calling a video slot ‘video’ if there is little to no movement or interesting graphics popping out of the screen. It almost feels a little dated. With a Wild and Scatter symbol, a Gamble and Free Spins Bonus Feature, it’s a fairly decent if standard mobile slot from the growing Microgaming range of mobile slots. Wild: The Wild Stallion symbol is wild and replaces all symbols except scatter. Any wins with a wild symbol are doubled. Gamble Feature: A common feature in Microgaming slots, you can double your winnings by choosing red or black or quadruple them by guessing the suit of the cards. Free Spins: You only get 10 free spins, but all wins are quadruple, making wins during this feature exciting indeed. To activate this feature you need 3 or more scatter Trumpet symbols to appear anywhere on the screen. We are not a huge fan of the theme or graphics, but that's down to personal taste. A low to medium volatility slot with a decent return to player rate, Tally Ho mobile slot will feel familiar to all who have played the original Thunderstruck slot. Add 10 free spins with a 4x multiplier and a decent 120,000 jackpot and you get some good game play. It's all mostly down to whether you like the foxy high lifestyle theme.